Of course, flat roofs are not really flat but have a very slight roof pitch of between 1/4" to 1/2" per foot. Just enough slope to drain water but also flat enough to be a problem if not constructed properly. The good news is that there are material options for your flat roof beyond traditional hot-mopped built-up roofing that will increase the reliability of the flat roof. Of all these membrane types EPDM, a synthetic rubber is the most common single-ply membrane roof material in both residential and commercial use. 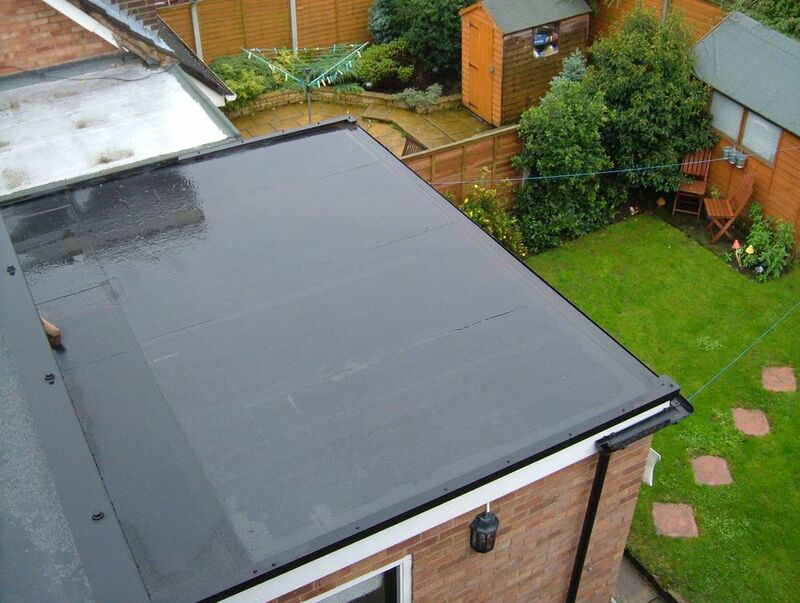 So all you really need to be able to say to your roof contractor is you want an EPDM rubber roof. These roofs are installed as thin sheet materials 0.030 (30 mils) to 0.060 inches (60 mils) thick and are applied to the roof in a single layer. Being made of synthetic rubber or polymer, they are flexible and elastic and are able to handle temperature changes and some impact types better than built-up roofs. Membrane roofs are attached in a variety of ways. They can be partially loose laid and held down with river rock ballast (requires roof structure to support the weight) or fully adhered to the roof deck. EPDM and Neoprene roof seams are fastened by adhesive and PVC roof seams are heat or solvent welded. Modified bitumen cap sheet roofing was developed in the 1960's as a replacement technology for BUR, or built-up roofing, by using the proven technology of BUR but also adding polymer reinforced roof wear layers or cap sheets. The polymer used in the cap sheet provides improved elasticity and flexibility in lower temperatures. The most commonly used polymers are atactic polypropylene (APP) and styrene butadiene styrene (SBS). SBS imparts a rubber-like characteristic to the bitumen. SBS cap sheets are usually installed using cold adhesives or hot asphalt tar. Thermoplastic APP sheets, on the other hand, are installed using the torch applied method. Going back about 120 years, the grandfather of flat roofs is the built-up roof or BUR. Built up roofs have solved the low pitch roof problem for ages, a challenge that asphalt shingles could never handle. Built-up roofs are installed using several layers of a special type of roofing felt that has been asphalt impregnated and embedded in bitumen applied with a hot mop. The hot applied asphalt or coal tar pitch blends with the bitumen-soaked roof felt and creates a monolithic roof membrane. The roof felt/asphalt tar layering is repeated in overlapping layers until the assembly is two to fours plies in thickness. A wear surface of finely crushed stone granules is usually applied to the top layer of hot tar to protect the built-up roof assembly from UV light and weather.